In the spirit of The Paris Wife and Loving Frank, the provocative and compelling story of one of the most fascinating and influential figures of the twentieth century: Margaret Sanger, the founder of Planned Parenthood—an indomitable woman who, more than any other, and at great personal cost, shaped the sexual landscape we inhabit today. This complex enigmatic revolutionary was at once vain and charismatic, generous and ruthless, sexually impulsive and coolly calculating—a competitive, self-centered woman who championed all women, a conflicted mother who suffered the worst tragedy a parent can experience. From opening the first illegal birth control clinic in America in 1916 through the founding of Planned Parenthood to the arrival of the Pill in the 1960s, Margaret Sanger sacrificed two husbands, three children, and scores of lovers in her fight for sexual equality and freedom. 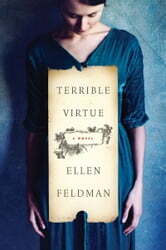 With cameos by such legendary figures as Emma Goldman, John Reed, Big Bill Haywood, H. G. Wells, and the love of Margaret’s life, Havelock Ellis, this richly imagined portrait of a larger-than-life woman is at once sympathetic to her suffering and unsparing of her faults. Deeply insightful, Terrible Virtue is Margaret Sanger’s story as she herself might have told it.